Busy Summer on the River! The cove’s been humming along this season — and as usual, the internet is neglected as we all play outside. ‘Tis the season for . . . whitewater. Tons of it. This has been one of our wettest seasons on record. I love the way they tell you what fish you’re looking at. One of these years, I’m going to know my river fish. What we’re doing this time of year: Figuring out our plans for a cider run. Perdeaux Fruit Farm, formerly Purdue’s, on Highway 11, is the one of the best cider-suppliers in the southeast. Last year Jon made several Friday-afternoon appointments to get his 5-gallon carboy filled as the cider came out of the press. (You can just buy their gallon- or half-gallon jugs for the same price). The apples are flash-pasteurized whole, and then pressed immediately, which is in our experience the best balance between food safety and freshness. Great supplier, willing to work with you to get you the produce you need, how you need it. FYI, Palmetto Cove has nothing whatsoever to do with the fruit farm. Jon and I just like their food. Read about the Palmetto Trail here. It’s not too hard of a hike. (Table Rock or something is a hard hike). Not very steep except for a tiny bit. 7 year-old carried a pack and did great. It took half an hour or less to get in to this view. There’s some different trails you can hike in a loop. Not even half-day hike for this section — hiked about an hour at the most on this outing, including loops. 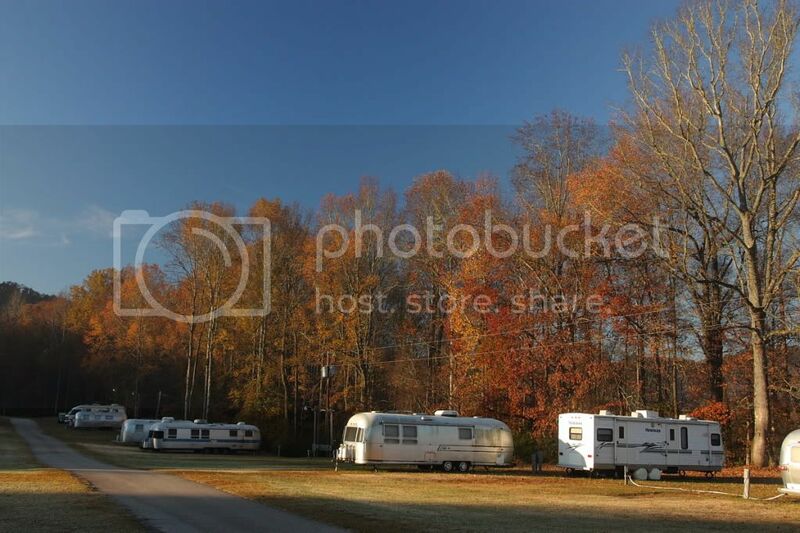 Campground closes Nov. 15th. Come camp one last time before hibernation. 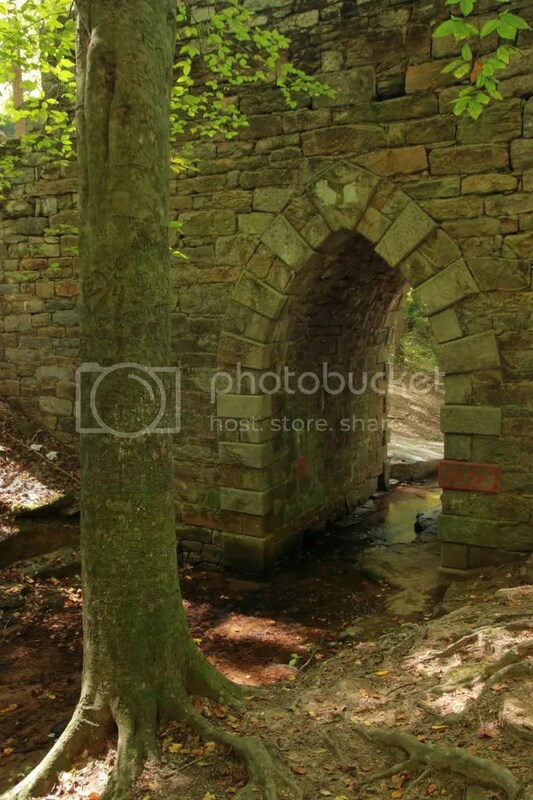 Poinsett Bridge, off Highway 25. Read about it at Wikipedia. Part of the Poinsett Bridge Heritage Preserve, managed by SC’s Department of Natural Resources. It’s a something-minute drive from Palmetto Cove. Not that far. You park across the road in the parking lot — not a busy road. You can see the bridge from the road. 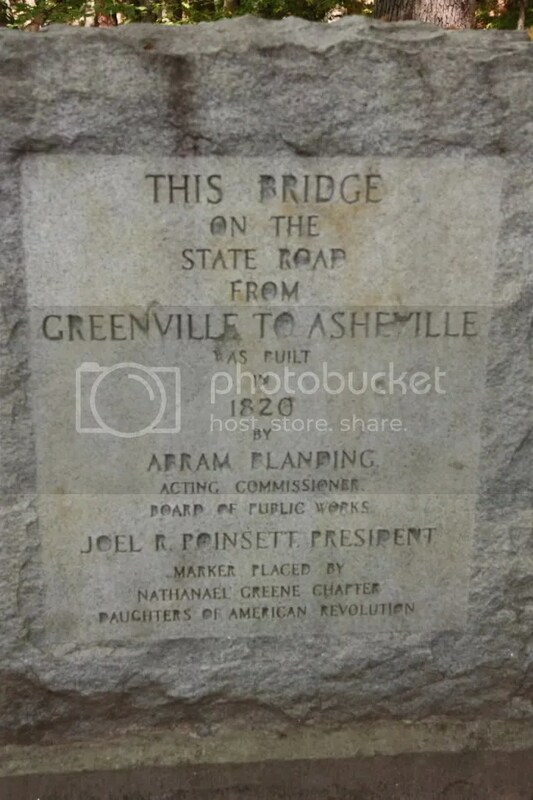 Cross the road and go down the steps, and the bridge is right there. There’s a path that you can get down to the arch of the bridge. I sneaked off to Portland, Oregon for ten days, sorry no photos because nobody would lend me their camera. Well, the four-year-old offered me her Crayola camera, but I politely declined. Yes, I am the only human member of my family who does not own a camera. I never need one, because how often do I go someplace with out one of my photographers in tow? Not often. You can see the water level is down considerably from the raging torrent earlier this spring. 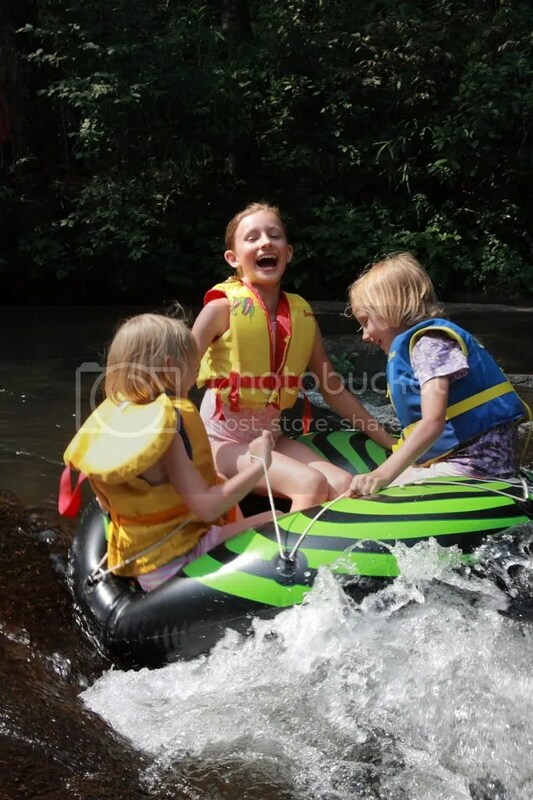 At the usual summer water levels, there is a great kid-friendly tubing circuit around the rocks in the swimming area. 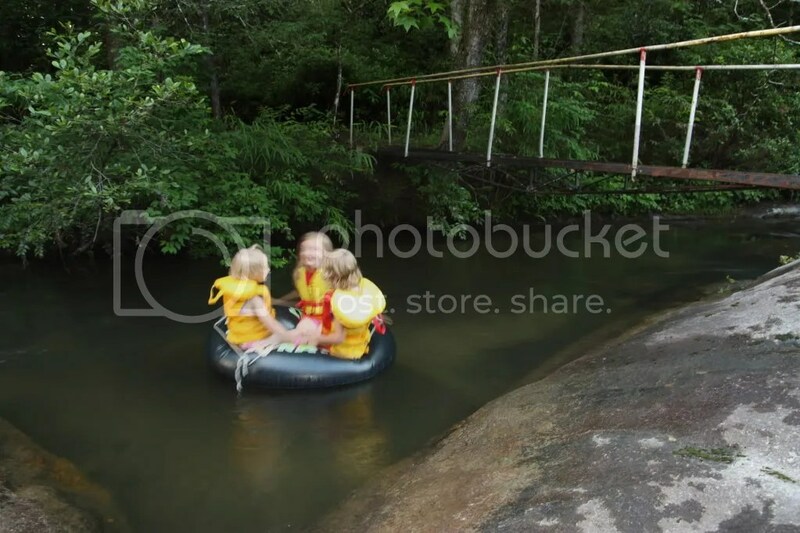 Children can do endless loops down the chute and then scamble back up the rock, down the chute, over . . . and over . . . and over . . . and over. Pays to have a big kid who can help the littles, so adults can settle into a quiet spot and just lifeguard. If you want a shady beach in still waters, from the bridge walk downstream on the footpath another four or five yards. There is beach in the trees just below the rocks. A few more notes on summer camping at the Cove. Yes, it gets hot. About 90 – 95 would be a typical high. (Usually not much higher). Down in the camping area, you will want to to have AC for your unit. Tropical-types could just plan to be elsewhere during the day and plug in a fan at night, it does cool down a bit in the evenings. But the camping sites get sun most or all of the day, so they do warm up. The shelter STAYS COOL!! Yes. Outside. The big picnic pavillion with all the rocking chairs sits up on a hill in the shade and is open on three sides, so you get a marvelous breeze. Plenty of picnic tables (and grills) so you can take all your meals up to the shelter. Of course the river is the place to be. Not bad hiking up in the mountains, either, if you are a hiker. Trails are all shaded, which means that there isn’t a view unless the ranger tells you there is a view (Table Rock has a great view at the top). But the shade + elevation keeps things comfortable in a summery, not-afraid-to-sweat-a-little outdoorsy way. 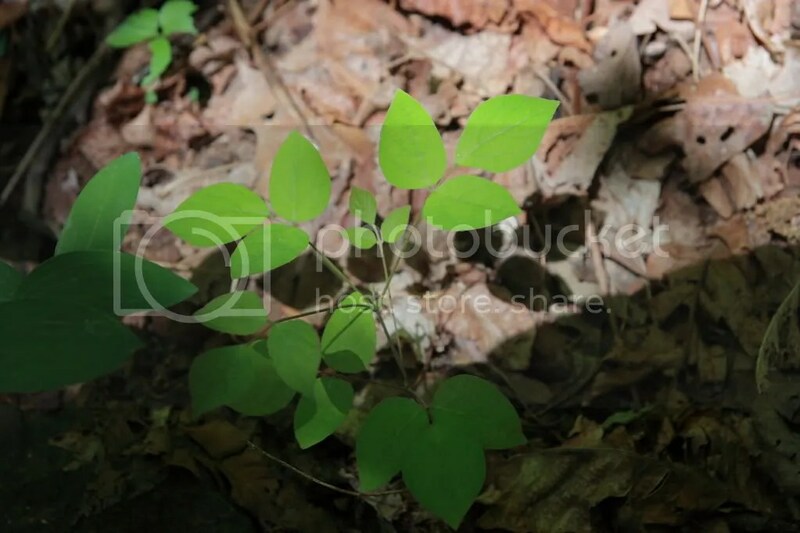 Lots of beautiful sweeping panoramas of the forest floor to be had as you come around bends in the trail. If you are hosting a rally at the Cove, yes both the meeting hall and the clubhouse have A/C. A few weeks ago we heard from our long-ago college hiking buddy Steph Jeffries*, now a naturalist at Duke University, when she saw Palmetto Cove’s new facebook page. 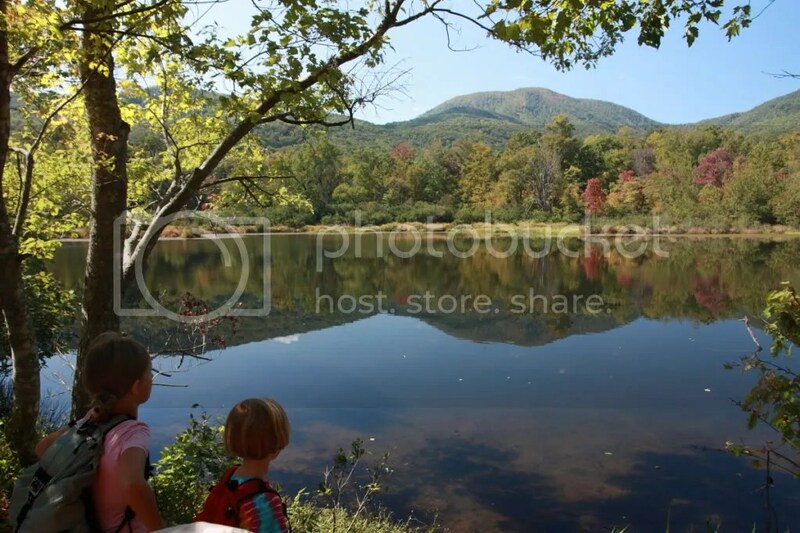 She had just been in the area working on a field guide to the southern Appalachians, and was planning to include several of our favorite Cove-area hikes in the book. Jon jumped on the chance to quiz her about some mystery plants he’d seen on the trail lately. Steph’s answers are at the bottom. 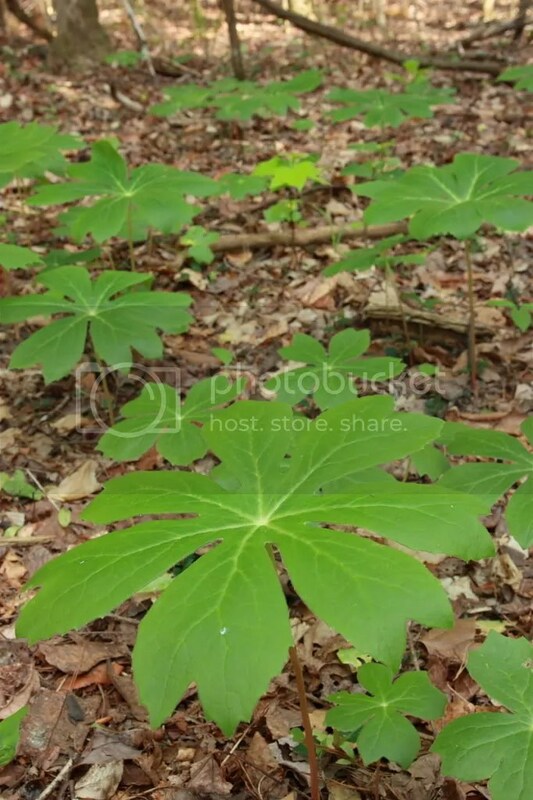 The first one is mayapple, Podophyllum punctatum. Look for plants that have two leaves and then look underneath for the white flowers in mid-April (maybe earlier for SC) and the fruits after that. 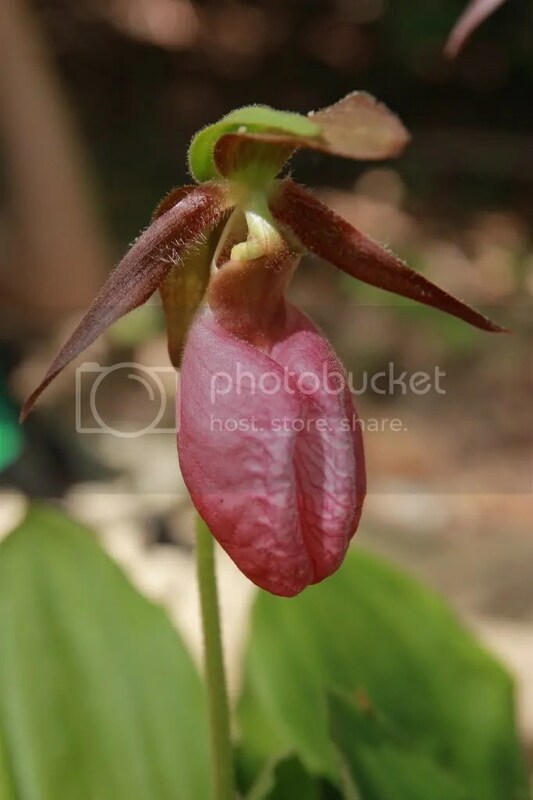 The second is pink lady’s slipper, an orchid, Cypripedium acaule. The third one is something in the pea family for sure, and I’d guess it’s either a vine called hog peanut (Amphicarpaea bracteata) or a perennial called nakedflower ticktrefoil (Desmodium nudiflorum). Stephanie Jeffries is a naturalist at heart and a forest ecologist by training. She has a Ph.D. in forestry from N.C. State, with minors in ecology and botany, and a B.S. in marine science from University of South Carolina. She has been a Fellow in the Thompson Writing Program at Duke University since 2007, and has taught in a variety of settings, including the Highlands Biological Station, NC State, the N.C. Museum of Natural Sciences, and the NC Botanical Garden. She has broad interests in plant conservation, forest dynamics and succession, and plant community ecology, as well as experiential and environmental education and service learning. 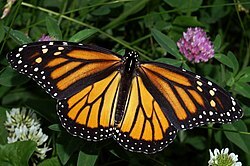 She loves teaching outdoors and sharing the wonders of the natural world with students of all ages and backgrounds. Is your group missing? Or need to update a link? Click Here. Palmetto Cove is a non-profit organization run by member volunteers. "We" refers to the 100 or so member families who participate in various ways with the work of running the campground. There's an elected board of directors, and volunteers take turns hosting, running the office, and maintaining the facility. The corporate annual meeting is in October. Originally Palmetto Cove was formed as the headquarters of the Palmetto State chapter of the WBCCI, but today it open to all RV owners, regardless of whether they own an Airstream or are members of the Airstream club. All photos are by Jon Fitz unless otherwise noted, all rights reserved. 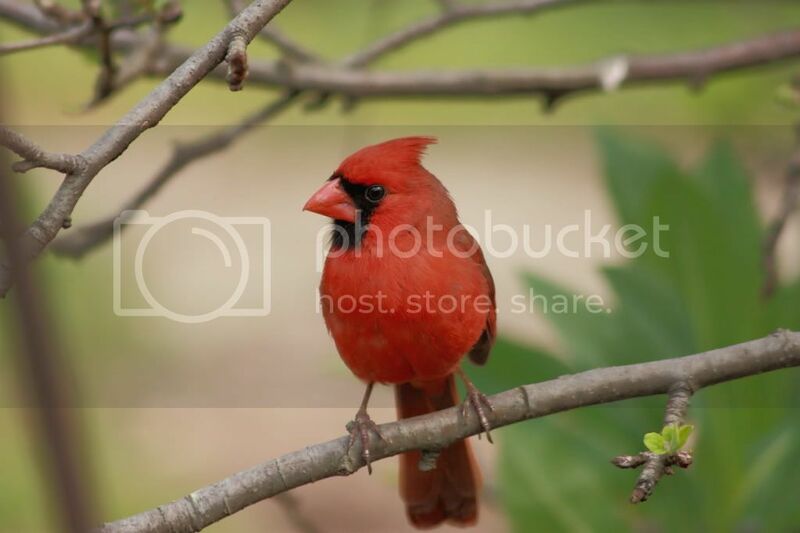 For more information on borrowing a picture, e-mail Jennifer Fitz at: currentresident [at] fitzes [dot] com.